The Dermapen™ uses 11 micro sized 33 gauge micro needles to stimulate the dermis faster than a manual dermal roller, resulting in shorter treatment times. 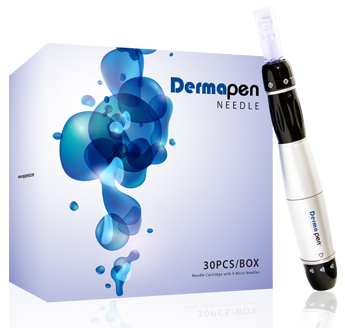 With an adjustable needle ( depth/length ) , the Dermapen™ needles vertically pierce the skin to enhance rejuvenation results, maintain epidermal integrity and reduce patient down time. Dermapen™ is an electronically powered micro needling device that uses a singular spring-loaded micro needle tip to puncture small holes at a rate of 1000/second.